We use a lot of acronyms and abbreviations in our modern world. LOL—laugh out loud; ASAP—as soon as possible; TTFN—ta ta for now. Here’s another one you may be familiar with: BMI. Body Mass Index (BMI) is a simple calculation used to determine if a person’s weight is appropriate for their height and is a fairly reliable estimate of body fat for most adults. You can easily find your BMI using a calculator like this one from CDC. 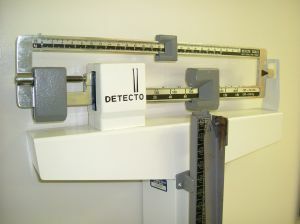 A BMI between 18.5 and 24.9 is considered normal; anything below 18.5 is classified as underweight. Along the same lines, a BMI between 25 and 29.9 is considered overweight and, taking it one step beyond, anything above 30 is considered obese. Because there is a connection between weight and some chronic diseases, BMI is often used as a screening tool to identify potential risk for developing conditions such as hypertension, Type 2 Diabetes and stroke. However, BMI does have some limitations. For starters, BMI is calculated using the total weight—meaning it doesn’t distinguish between body fat and other elements that contribute to a person’s weight (bones, organs, muscle, etc). Since muscle weighs more than fat, it’s possible for someone with a muscular build and little body fat to fall in the “overweight” category. Many professional athletes, for instance, have BMI in the overweight range because of the muscle they develop during training. Secondly, BMI is a generalization. Everyone is different and body composition varies by age and gender. The important thing to remember is BMI is a guideline and isn’t meant to be used to diagnose health risks. However, regular exercise and a healthy diet can help you reach or maintain a healthy weight. If you have questions about weight loss or BMI, you may want to talk to your health care provider or a registered dietitian.